Polka dots are back for Spring say all the magazines! Trends may come and go, but there are few prints that truly never go out of style. Spots, stars, leopard print are the only prints I advise my clients to buy for longevity, these never look old or out dated. But polka dots are absolutely everywhere this season so if you are looking for something to refresh you current transitional wardrobe, then you should invest in the super spot. It often gets a bad rap, and if you associate polka dots with Minnie Mouse or the party dresses you wore as a little girl, it's time to rethink the surprisingly versatile and elegant print. In the right hands, polka dots can strike that tricky balance between modern and elegant. Cropping up repeatedly on the SS18 catwalks, including Balenciaga, Self-Portrait, Mary Katrantzou, Giorgio Armani and Dior, we were offered multiple ways to wear polka dots, from Demna Gvasalia's chiffon dresses worn with sock booties to Maria Grazia Chiuri's monochrome sheer skirts and blouses. Additionally, street style stars have been giving us a masterclass in putting together perfect polka dot ensembles, proving the print isn't just for the catwalk but can be incorporated into a casual look too. Read my 5 style tips for inspiration and follow my pinterest board for more looks - Going dotty 2018. Wearing 2 different pieces in spots gives the print a fresh take and you an updated look. Mixing high & low styling, pair a jumper with an evening skirt for a fresh daytime outfit. You can't go wrong with a spotty jumpsuit. You can play with colour too - using tones such as brown, red and navy give a cool impact. By adding a biker jacket over your dress or jumpsuit you have instantly created a chic day to evening look. The spot print is perfect for the office, lunch out or a meeting - presentable yet stylish. Marc Jacobs said “There is never a wrong time for a polka dot”. And how can you blame him? 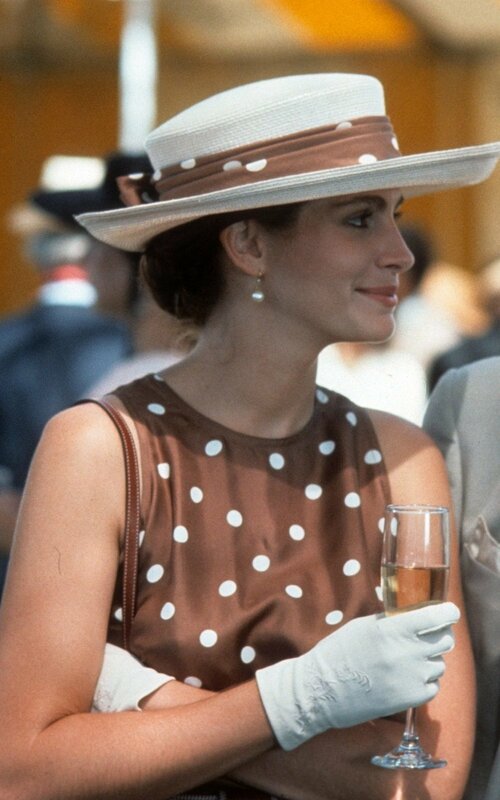 Polka dots are a timeless classic that always see come back on trend in their many changes of style. Probably it’s because dots take us back to 50's elegance, to the curvy pin-ups and unforgettable style icons like Audrey Hepburn or Marilyn Monroe. Or can be seen in many iconic movies, style moments and even royalty. So while ‘mix and match’ still takes centre stage with the street styles, its' the black & white polka dots that are stealing the scene. So make dots the newest addition to your wardrobe because if there was one trend that works in all seasons it's this one, so if you invest in a polka dot top or dress you can wear it all year round. See my picks to shop now. Like most of the females I know, I am so over wearing my parka, my puffa, my pea coat and anything else that covers me up from the impending doom of cold, frost and snow. I can’t stand the sight of my winter stuff any more, but it’s too cold not to wear it. The massive coat that felt fabulously cosy back in January now feels bulky and tiresome, my chunky jumpers almost suffocating and let’s not even get started on the expanding collection of knitted scarves and hats. I AM READY FOR SPRING DRESSING! But trans seasonal dressing can be tricky with the constantly changing weather so my advice is to invest in a transitional coat or jacket. This piece will give your Spring wardrobe the newness it needs without buying lots of items to make up an outfit and it is something you are no doubt going to get lots of wear out of. Layering can be key to these jackets, whether it be still layering knitwear underneath them or a smaller jacket underneath or even a knitted scarf over the top. In fashion we like to look to the future, so here's to dreaming about warmer weather, sunnier days a sporting a fab new coloured trench down to the shops. There is plenty to inspire you, here are my trans seasonal jacket style inspiration and shopping highlights. Blazers were the 2017 trend that no one saw coming. After all, the tried-and-true wardrobe staple is the key to professional power dressing for so many women, so how could it be deemed “trendy”? But, in fact, we saw the staple jacket in checkered prints all over the street during fashion month, with countless iterations following suit. The trend looks to continue but if you wanted an updated look then be inspired but vibrant colours, structured styles and luxe fabrics. Just as we dare to think about sunnier days and lunch al fresco, it has started raining again! But it's ok as fashion is ready for the rain, this year the trend has gone practical, welcoming even. Suddenly the high street is full of practical clothes that fit into our daily lives. One such item is the anorak, which is, as it happens, the perfect coat for this time of year. It’s not a piece of clothing that suggests great beauty, I grant you that, but the current offering from the likes of Zara, Topshop and Mango are actually pretty great. The duster coat is everywhere again now, Meghan Markle has been champoining the trend since her engagement photos and brought it back into the fashion front row. It remains the perfect between seasons cover-up, wear over anything and everything. Sometimes belted or with a button and at more or less any length, whatever the weather has in store. These are easy, smart and often colourful cover-ups, the perfect wardrobe refresh to move seamlessly into Spring wearing. The bomber jacket has been around for a couple of seasons now, but it is here to stay. This season it's gone feminine, printed florals, embroideries and embellishments, the perfect Spring piece to elevate the darker pieces in your wardrobe such as black, navy, grey and khaki. They are also the perfect day to evening jacket to be thrown over a dress or jumpsuit with a cold glass of Rosa wine. A favourite from Autumn is still going to be going strong in Spring. The check jacket has now become a wardrobe staple serving to upgrade basic outfits such as tee's and jeans, sweaters and trousers, blouses and skirts. So if you don't have a check blazer by now then now is the time to get one.